According to preliminary data, the prices of old dwellings in blocks of flats fell by 0.7 per cent in the whole country compared to the previous quarter. Prices went down by 0.5 per cent in Greater Helsinki and by 0.9 per cent in the rest of Finland. Compared with the corresponding quarter of 2013, prices rose by 0.9 per cent in the whole country. In Greater Helsinki, prices rose by 1.6 per cent and in the rest of the country they remained nearly unchanged. Viewed by type of apartment, prices of one-room flats increased by most from the previous quarter in the rest of the country. Prices of one-room flats rose by 1.9 per cent in the rest of the country and by 0.4 per cent in Greater Helsinki. Over the same period, prices of two-room flats rose by 0.5 per cent in Greater Helsinki but decreased by 1.0 per cent in the rest of the country. Prices of three-room and larger flats went down by 1.2 per cent both in Greater Helsinki and in the rest of the country. In the first quarter of 2014, the average price per square metre of an old dwelling in a block of flats was EUR 2,393 in the whole country, EUR 3,678 in Greater Helsinki and EUR 1,682 elsewhere in the country. Prices of new dwellings in blocks of flats went up by 4.2 per cent from the previous quarter in the whole country. 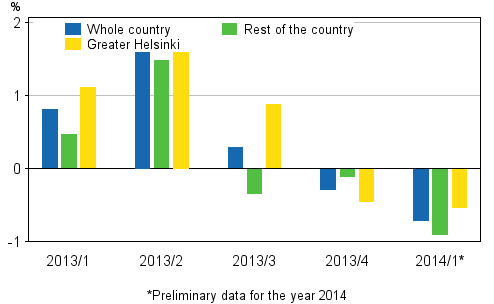 Prices went up by 8.3 per cent in Greater Helsinki and by 1.4 per cent elsewhere in Finland. Examined by major region, prices grew by most in Eastern Finland, by 12.0 per cent. In Northern Finland prices fell by 6.5 per cent and in Southern Finland by 1.0 per cent. Compared with the corresponding period of 2013, prices of new dwellings in blocks of flats went up by 2.6 per cent in the whole country. In Greater Helsinki, prices rose by 6.8 per cent and in the rest of Finland they remained nearly unchanged. Examined by major region, prices rose by most in Eastern Finland, by 10.2 per cent. Prices fell by 0.5 per cent in Western Finland. In the first quarter of 2014, the average price per square metre of a new dwelling in a block of flats was EUR 4,005 in the whole country, EUR 5,402 in Greater Helsinki and EUR 3,354 elsewhere in the country. Prices of dwellings in old blocks of flats went up in 2013 by an average of 2.7 per cent in the whole country from the previous year. In Greater Helsinki, the rise amounted to 3.9 per cent and in the rest of the country to 1.4 per cent. In Greater Helsinki, the price per square metre of an old dwelling in a block of flats was EUR 3,688 and in the rest of Finland EUR 1,684. ISSN=2323-8801. March 2014, 1. Prices of old dwellings in blocks of flats fell in the January to March period . Helsinki: Statistics Finland [referred: 20.4.2019].